Lets just say that these t-shirts are probably the best cotton t-shirts ever to have graced the face of the earth. We sell used ones for a preposterous price, come get yer own! 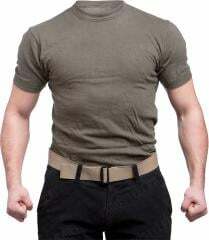 The Bundeswehr t-shirts are high quality shirts made of durable 100% cotton fabric with tough seams. These fit better, last longer and look a lot better than most other shirts. First easy size, then chest circumference in centimetres, then German size in brackets. All in nice used shape, well washed. No holes or anything. Some are a bit faded but all are in perfectly serviceable condition. Erinomainen työ- ja aluspaita. Miksei ihan arkipaitakin jos tykkää. Ostin yli 5 vuotta sitten pari eivätkä ole menneet miksikään. Todella hyvä paita,istuu hyvin ja tarpeeksi pitkä helma paidassa ei ole heti selkäpaljaana kun vähän kyykkii. Puuvillaisten käytettyjen paitojen kanssa on aina vähän arpapeliä mitä saa - itse ostin näitä pari kappaletta ja kummassakin oli kaulus valmiiksi venynyt epämuotoisen näköiseksi. Sinänsä jos onnistaa ja saat lähes uudenveroisen/hyvin pidetyn paidan, on kangas ja työn jälki kuitenkin hyvää ja kokojärjestelmäänkin voi luottaa (toisin kuin monissa kaupan paidoissa, jossa S voi tarkoittaa kaikkea kääpiökokoisesta pienehköön telttaan). Super comfy cut, and finally a t-shirt that fits my skinny body without being terrible quality. Buying some more to dye black for variety! I own 4 of these. Great. Probably the best you can get. Not only for the price. The fit is superb and they are long enough to have inside the trousers without getting out all the time. Realy cool t-shirts. Tough and comfortable. Excellent t-shirts. Ordered 2, both having the usual surplus-warehouse smell. Some might need an extra wash due to additional odors ;-). Fit and feel are perfect, will order a few extra next time! Makee leikkaus ja sopivan pitkä helma. Ihana ylijäämän tuoksu. Ei kai se lähde pesemällä? En uskalla pestä. I own a number of these. As stated in the product description, "probably the best cotton t-shirts ever to have graced the face of the earth." Really. I've always ordered medium, and while there has been some variation in size, even the ones that are, um... a little 'snug' are still comfortable to wear. Buy two or three. You won't be sorry - unless you only order one. This solves two problems for me 1 finding a good quality t-shirt for cheap. 2 finally finding a long enough t-shirt that actually tugs into the pants and wont pop out the moment you blink. I bought 8 of these in 2013 half is still in good condition. So I would recommend you to buy a bunch and dye half of them black. 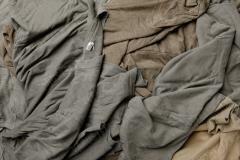 They are grey'ish in color so I dyed the nicer ones olive green after a few years of daily use, it made quite the difference. I wish i could lie in the review, because i want all these T-shirts to belong to me! What a great product, proper quality T-shirt. You won't find anything like this for the price! I am 173 and both Small½ and Medium fits Very well, however i like the Medium one because i always tuck T-shirt into pants. The description is spot on, these are the best shirts to grace the earth. Mukava puuvillainen t-paita, joka näyttää hyvältä. Tilaaminen on vain arpapeliä, paitojen kunto vaihtelee suuresti. Osa paidoista on uuden näköisiä ja särmiä, osa taas venähtäneitä tai lörpähtäneitä. I bought 3 of these shirts. 2 of them where fine and with the next order I bought another one because I was so happy with the first 2. The 3rd one had a huge head hole, I mean huge. It is completely unwearable. My shoulders were almost popping out of the neck hole and my chest was almost popping out (Might be a womens shirt?). It seems there are two models of these shirts as shown in the second picture. 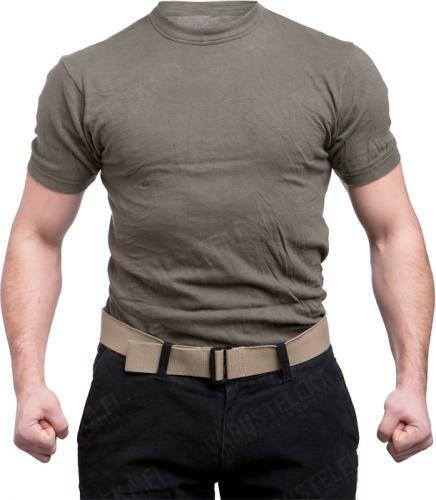 The light green shirts are the ones you do not want and the dark olive drab shirts are the ones you want. I love the first 2 dark green shirts I got. The other one was extremely disappointing to receive. However, for 5 bucks you can not go wrong just try different sizes and hope you get the dark green ones. I bought the Small½ / 96 cm and those were the dark green ones. Awesome cut and great material. I own seven of these. I have a 100 cm chest and ordered both sizes 6 and 7. The sizes do vary a bit by manufacturer. Some of the sixes fit like sevens and vice versa. And some of them are um, ahem, quite slim. My overall take? Size up 1 step unless you like super form-fitting shirts. Other than the warehouse/surplus smell, they are great as the other comments suggested. You won't regret it. I’ve bought six of this t-shirts and the quality is fantastic. The condition is kind of a lottery. Of my six items one was pretty much worn out and had to go directly to the bin one had a large stain of white paint. One had very visible signs of extensive use. However the other tree are in very good condition, extremely comfortable and would probably last for many years. If this kind of quality were somewhere to be found in an new t-shirt I’d gladly pay ten times more for it than for this surplus stuff. Tosi Hyvä ja koruttoman tyylikäs paita. I own five and have worn them for years in all sorts of conditions. There is some variation in fit and color/shade within sizes, all the more reason to buy more than one. I'm telling myself that I won't buy more, only so more people of the world may know their magnificence. Vahva suositus tälle. Otin pienimmän koon ja olin tietoinen, että miesten mitoituksilla paita on erilainen kuin naisten mitoituksilla tehdyt, jolloin pussitusta saattaa tulla paikkoihin, joihin sitä ei yleensä tule ja toisaalta saattaa kiristää toisista paikoista. Tällöin isomman koon valinta ei välttämättä ole vaihtoehto, ellei sitten halua pukeutua jättimäiseen säkkiin. Olen kyllä pirun tyytyväinen kaiken kaikkiaan. Paita on lähes käyttämättömän oloinen ja kangas tuntuu laadukkaalta. Jos tätä olisi naisten mitoituksella, tilaisin varmaan useamman. I bought 10 of these. When Varusteleka says this is the best cotton T-shirt ever, I had to buy some. The sizing is spot on. I can fit a medium or a large well at 186 cm and 80 kilos. The med is form fitting. These are in fact the nicest T-shirts ever produced. All mine came in very nice shape and are much appreciated. The quality is really unbelievable, you might want a lifetime supply after feeling one. Over the past year I've bought 8 of these shirts (3 med(6), 5 med1/2(7)), and they are by far some of the most comfortable shirts I've ever worn. These shirts have already received more than enough praise, but I feel like a little more couldn't hurt. The material is high quality, it's a solid base layer for winter, and it's nice n form fitting! The warehouse smell isn't so bad, so airing them out then washing them once or twice gets rid of it completely. To top it all off, they're a steal for the price you pay. I recommend these to anyone, everyone, anywhere AND everywhere! You couldn't possibly regret getting a shirt or five for yourself. Now, if only American made clothes provided the same quality and comfort. Paksua kangasta ja vaikuttaa tuotteelta joka kestää pitkään. Saman kokoisissa paidoissa tuntuu olevan yllättävän paljon eroa koossa, todennäköisesti osa on ollut venyvämmässä käyttössä kuin toiset. Pykälä oikeaa kokoa pienempi paita oli löysä eikä lainkaan särmän näköinen, toinen taas oli kooltaan juuri sopiva mutta leikkaus ei silti sopinut minulle, vaan paita vaatisi enemmän lihasta olka-alueelle. Eli paita ei istu kuten luvattu ainakaan minun kehonmuodoillani, laadukkaat siviilipaidat istuvat paremmin, joskin ne sitten ovat aina tehty ohuemmasta kankaasta eivätkä täten tule kestämään yhtä pitkään. Saamani yksilöt olivat kylläkin hyväkuntoisia ja jos ei istuvuudesta välitä tai keho on paidalle paremmin sopivan muotoinen, on tässä varmasti oikein hyvä paita. Got two of these. 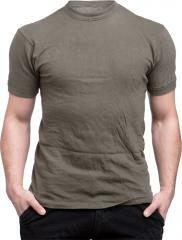 The first was pretty much what was advertised, a thick green t shirt, very well made and practical, with a modern slim cut. The second was a slightly different animal, a little thicker, with a low cut neck and hoodie-style cuffs on the arms. Again, very good item and I will wear it underneath collared shirts, but I'm knocking off half a star because these really should have been sold separately.